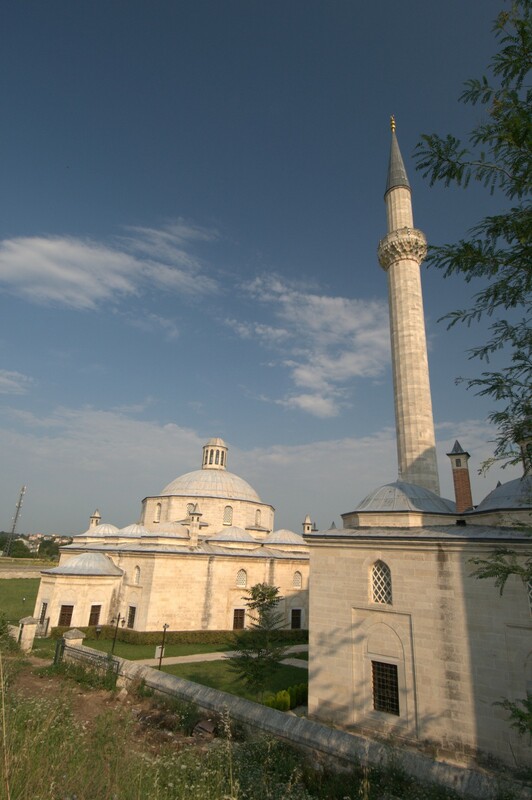 Sultan Bayezid II Mosque Complex is the most famous example of külliye in Edirne. 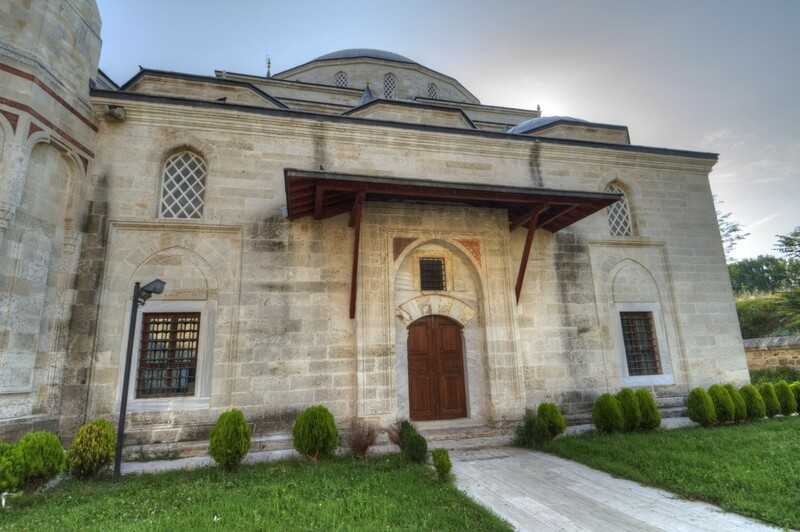 The phrase külliye means some buildings associated with Ottoman architecture, centred around a mosque, erected for various charitable services for the community. 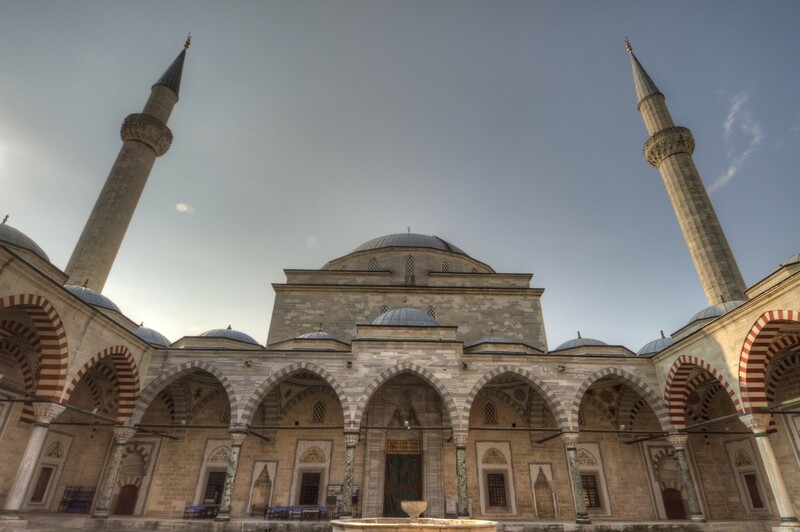 The designer of the Sultan Bayezid II Mosque Complex was most probably a famous architect known as Hayrettin, who acted on the orders of the Ottoman Sultan Bayezid II. 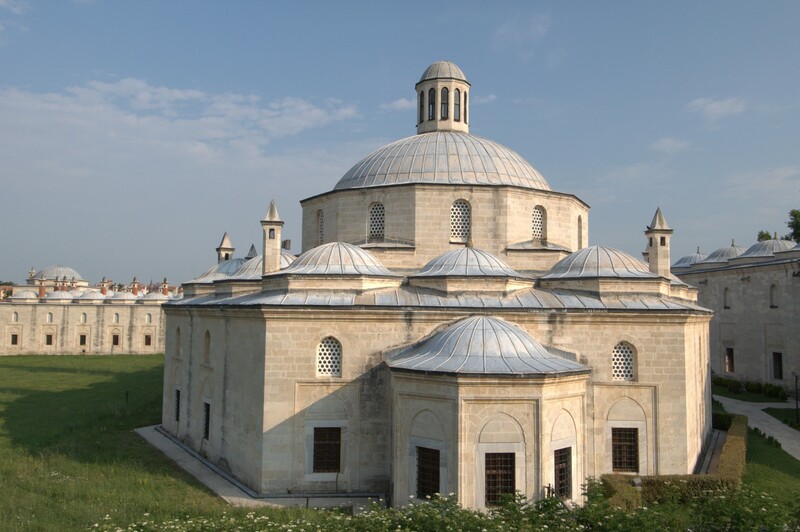 However, it is just a presumption made on the basis of the fact that Hayrettin constructed many important structures during the reign of Sultan Bayezid II. His person is rather mysterious as very little is known about his background and career. 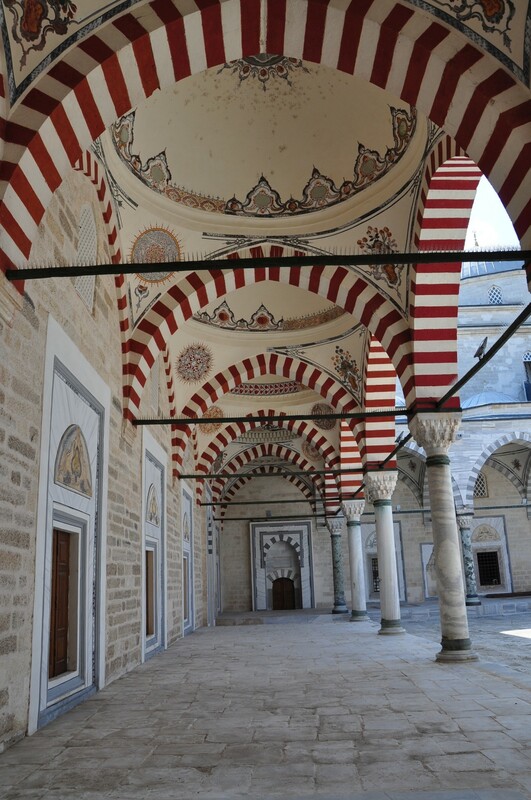 He was born into a family of architects as his father, Murat, had also been in this profession. 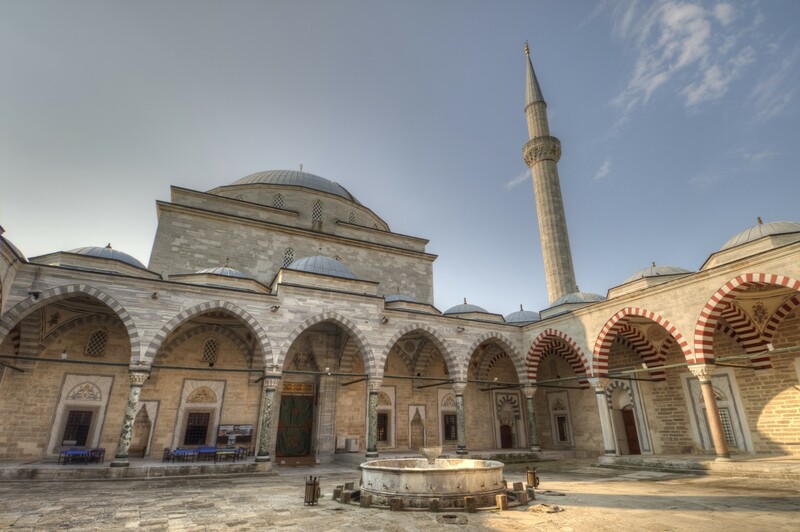 Many buildings erected at the end of the 15th century and the beginning of the 16th century have been attributed to Hayrettin without the hard evidence to support this claim. 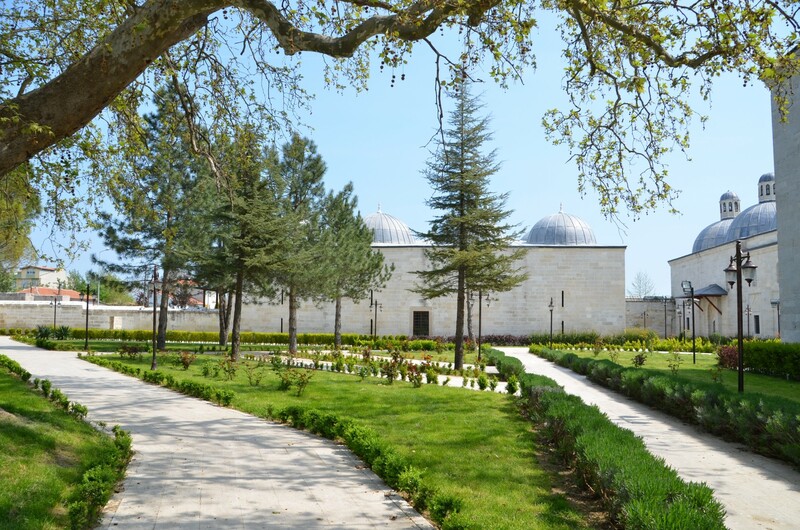 Therefore, some researchers, including Rıfkı Melül Meriç, have claimed that the builder of the Bayezid II Complex was Yakub Şah Bin Sultan Şah, another notable architect of that period. The construction of the complex began in 1484. 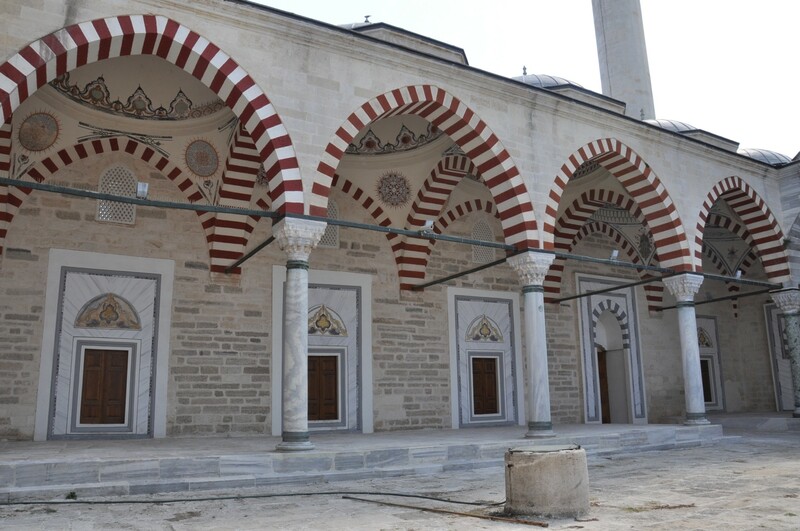 The details of the work progress are known thanks to Hoca Sadettin Efendi who lived in this period in Edirne. 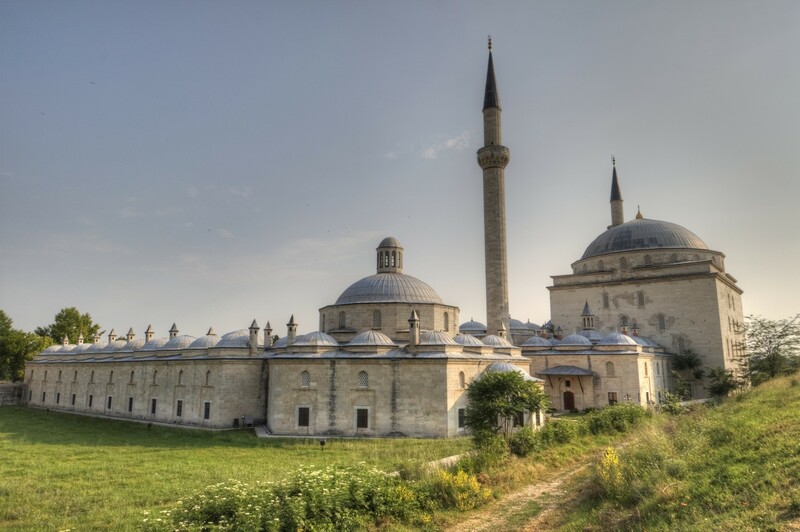 He stated that Sultan Bayezid II came to Edirne from Istanbul, to carry out was preparations on the 1st of March, 1484. He immediately ordered the construction of the complex because he needed a hospital in the city. The Sultan himself laid the foundation of the complex, as well as made a donation and distributed gifts to the public. The complex was ready in 1488, just after four years, thanks to the hard work of thousands of people. 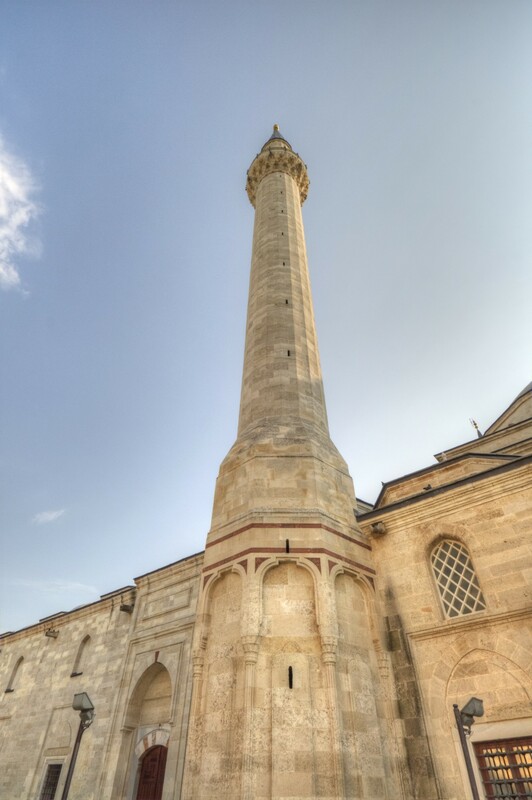 The opening ceremony of the complex took place in 1488, and was a glorious ceremony, according to Hoca Sadettin Efendi. He provided the details of the ceremony in these words: "Various presents were given to the guests, the tables were laid for the feast, plenty of charity was distributed to the poor". 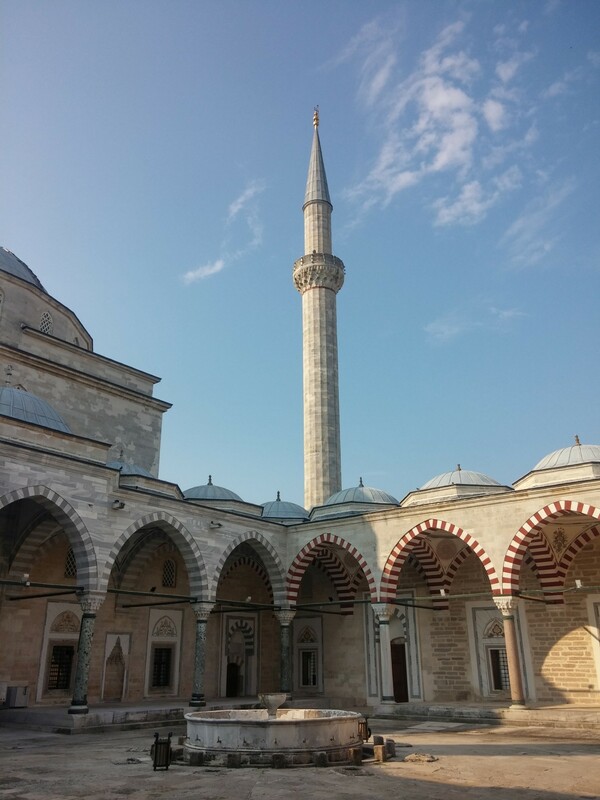 The architecture of the mosque places it between two other mosques of Edirne - Selimiye and Üç Şerefeli. 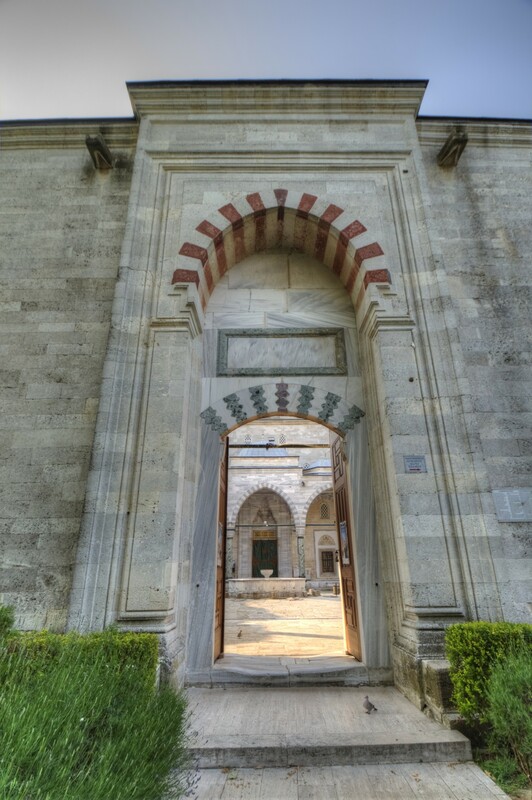 The visitors of the mosque first enter a spacious courtyard that has three entrances. 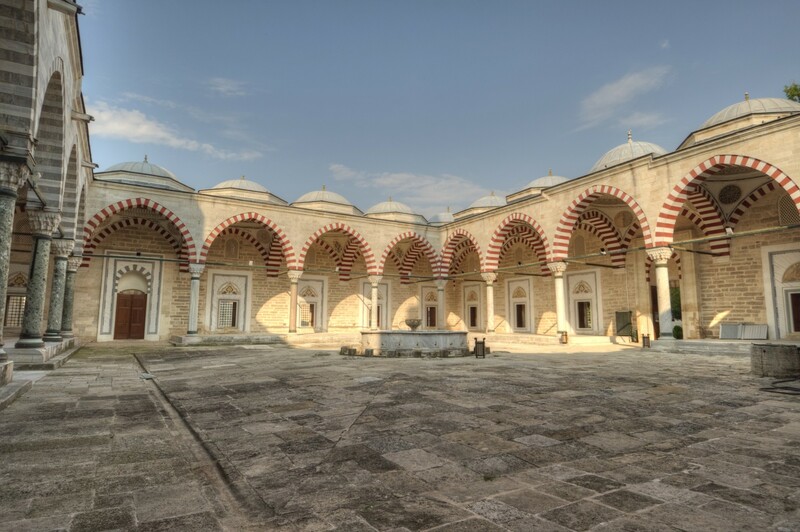 The courtyard is surrounded by domed porches, supported on marble and granite columns with capitals displaying muqarnas (honeycomb) ornamentation. 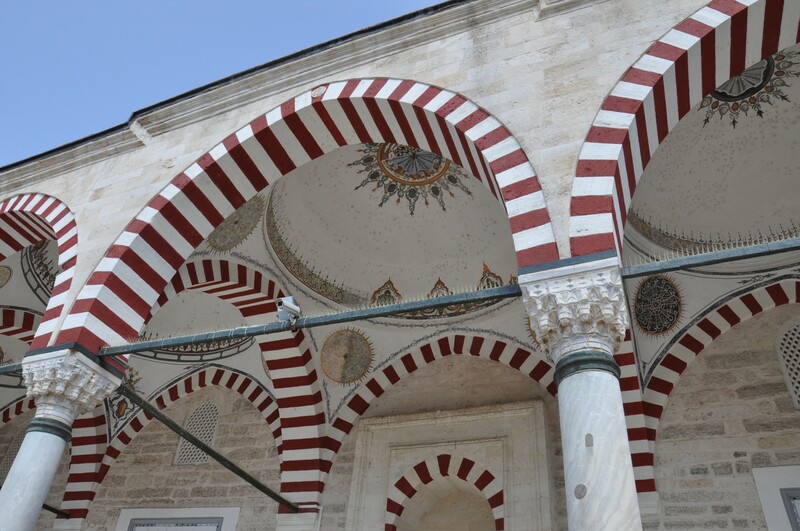 The arches between these columns are painted in red and white stripes. 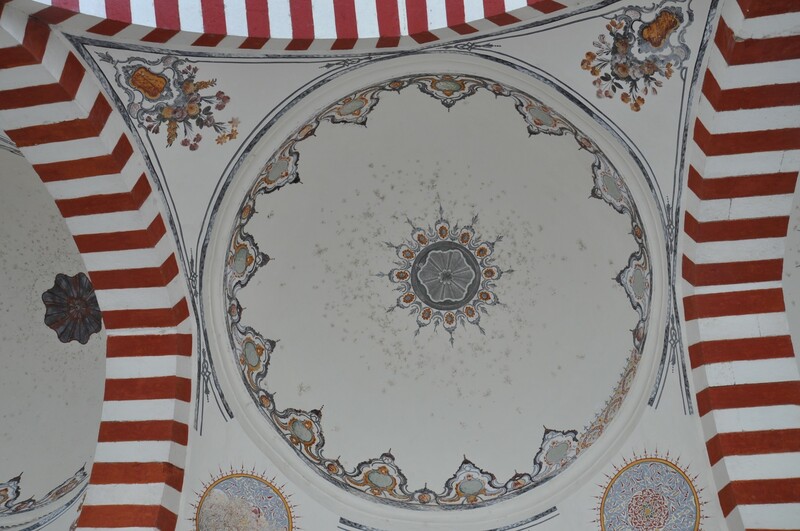 The insides of small domes covering the porches are beautifully painted in decorative patterns. 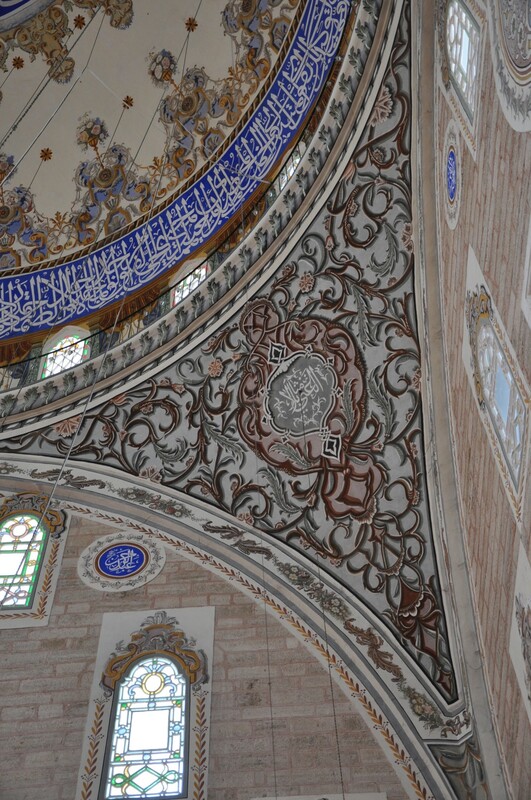 The dome above the arch leading to the mosque is slightly bigger and elevated. 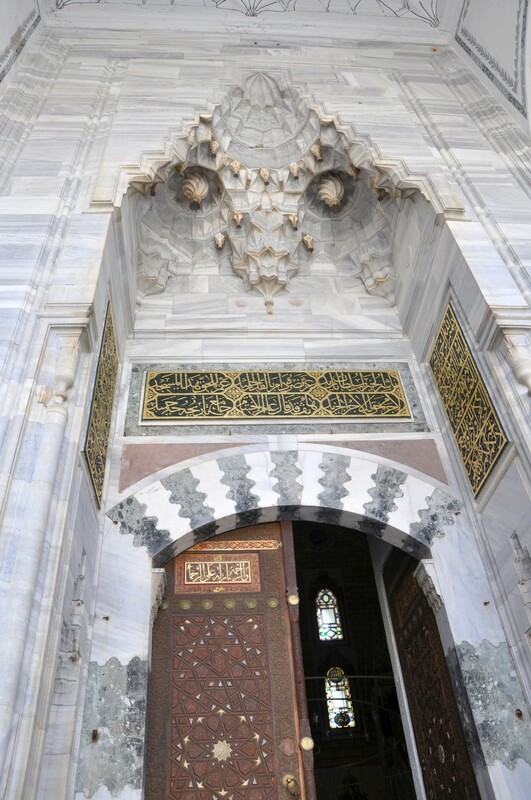 There are decorative niches with muqarnas pattern on both sides of the mosque entrance. The arch above the doors is made of black and white marble blocks. There is a massive muqarnas vault above the doors and three plates with gold calligraphic inscriptions on the black background. The door wings are made of wood, intricately carved in geometric patterns, resembling stars and flowers. There are numerous windows with wooden shutters, providing the illumination of the porches, and the frames around these windows are also painted, to create an illusion of multiple doors. In the centre of the courtyard, there is an ablution fountain with a pool. A small well stands on the northern side of the yard. 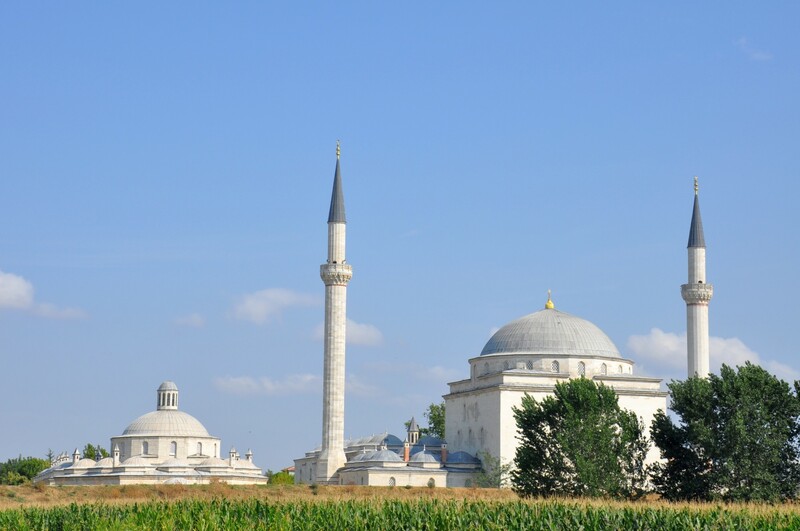 Two minarets rise above the mosque, to the north-east and south-west of the central dome. 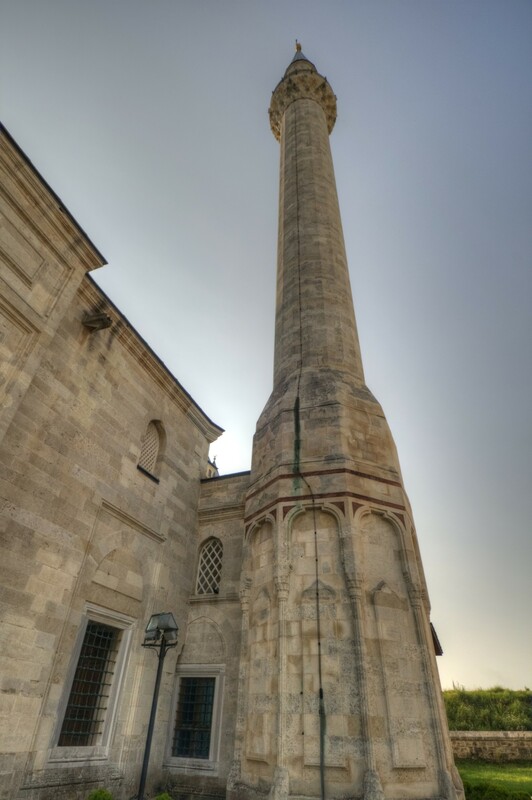 These minarets are of equal heigh of 38 meters and are decorated with a single balcony each. 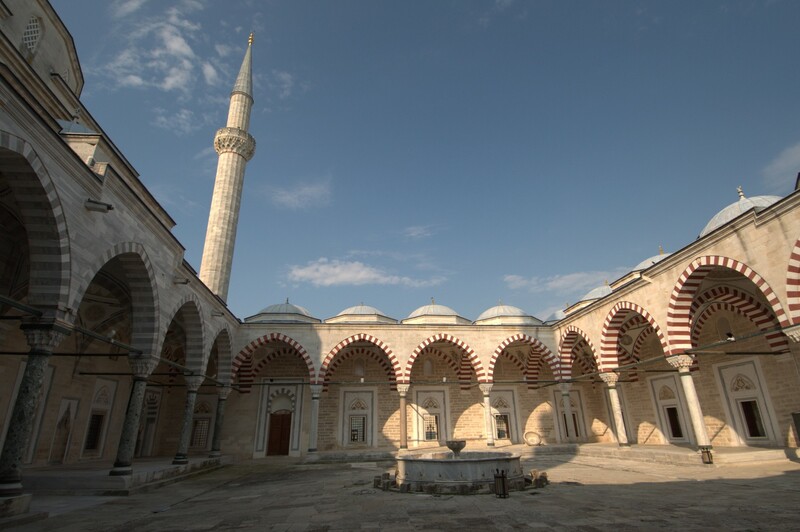 The courtyard of Sultan Bayezid II Mosque is close in architectural style to the courtyard of Üç Şerefeli Mosque. 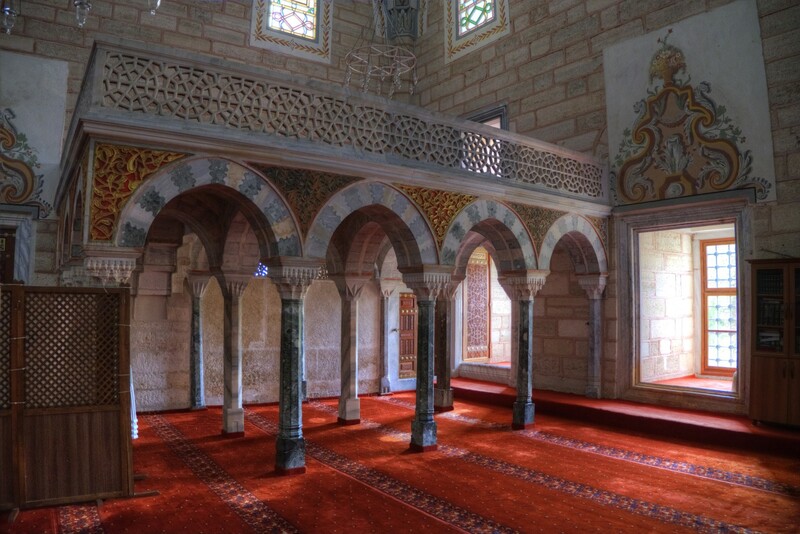 However, the spacious interior of the mosque resembles the Selimiye Mosque. 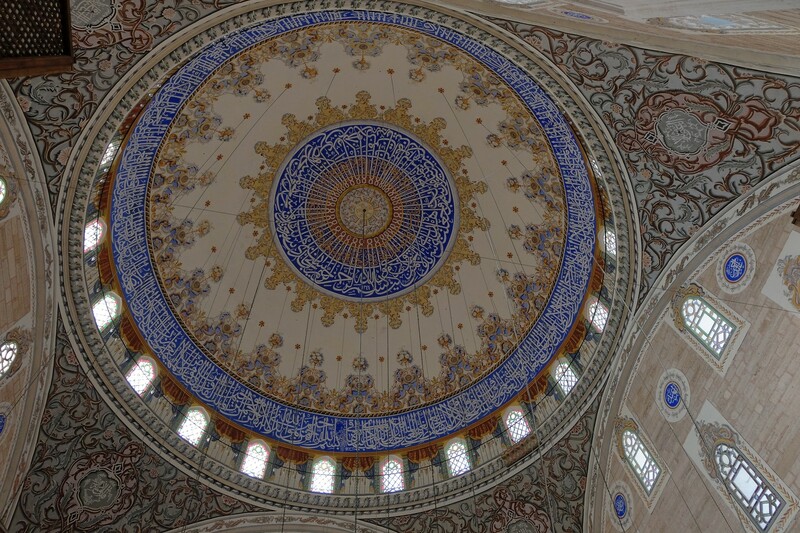 The prayer room is covered with a huge dome, with a diameter of 23 meters. The dome is supported by a substructure on a square plan, 19-meters high that carries a 20-sided drum. Each side of the drum has a window. 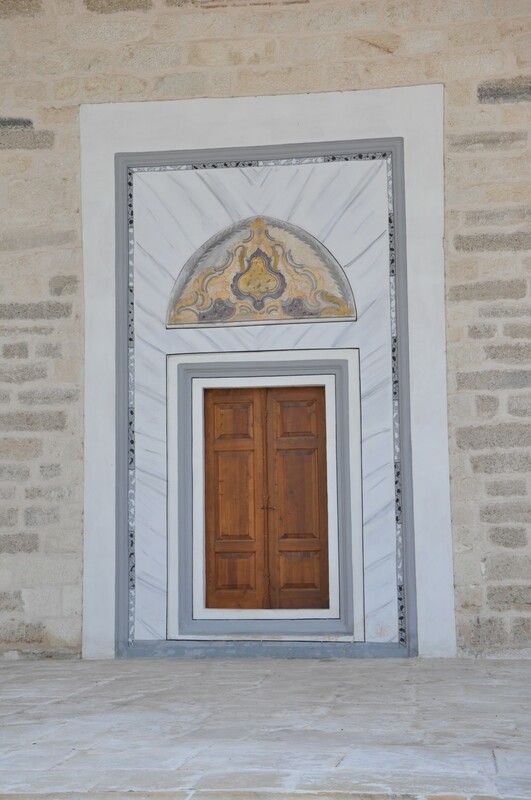 There are also numerous windows in the side walls of the mosque. 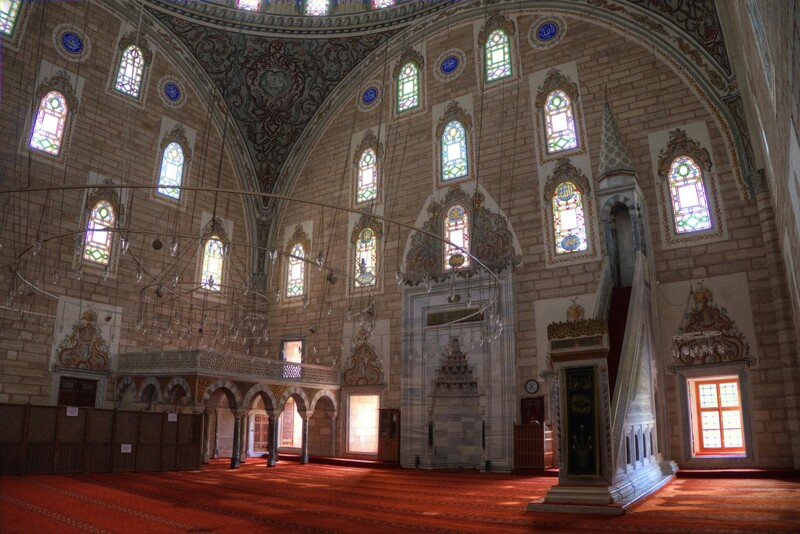 These stained glass windows not only provide illumination for the mosque but also play a decorative role, displaying geometric patterns and calligraphic inscriptions. 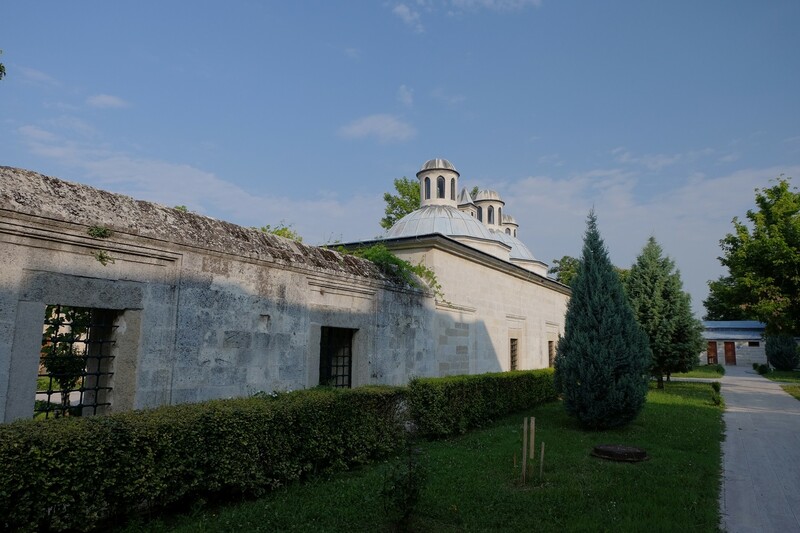 The main dome and the smaller courtyard domes are based on a wooden structure and covered with lead plates. 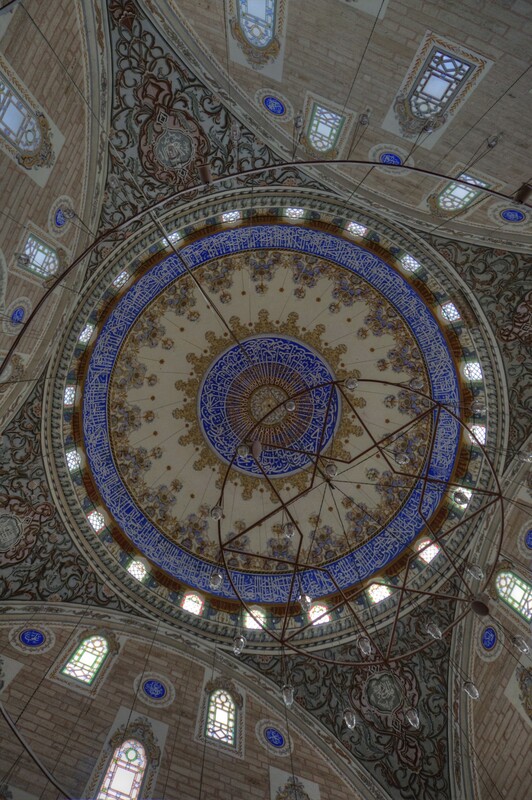 From the inside, the main dome is decorated with Arabic calligraphy, white on the blue background, running around its circumference and the second one, around its central point, There are also painted geometric and floral symmetric patterns, executed mainly and blue and golden hues. 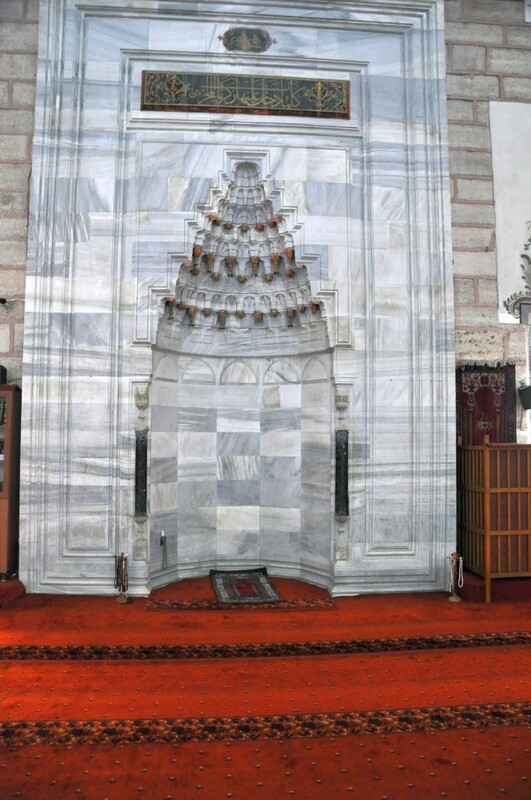 Mimbar and mihrab were made from the marble of different shades of grey and beige. 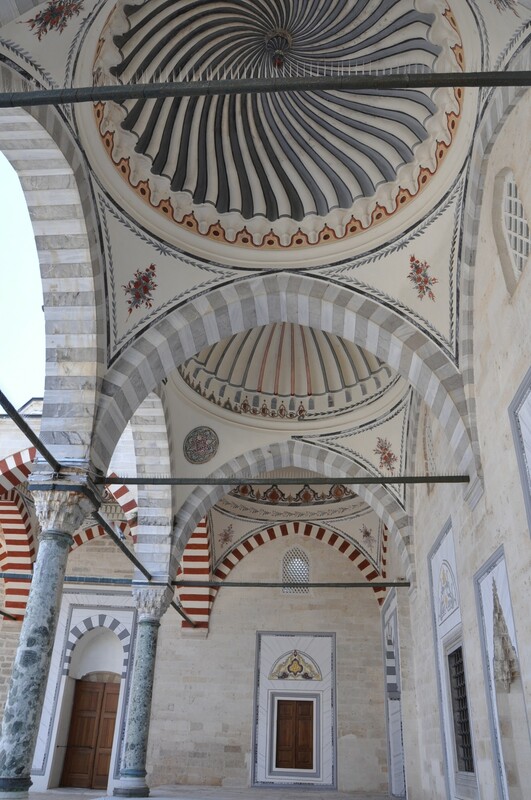 It is worth noting the use of rare varieties of granite, ophicalcite, and porphyry for decorative purposes in the mosque's interior. 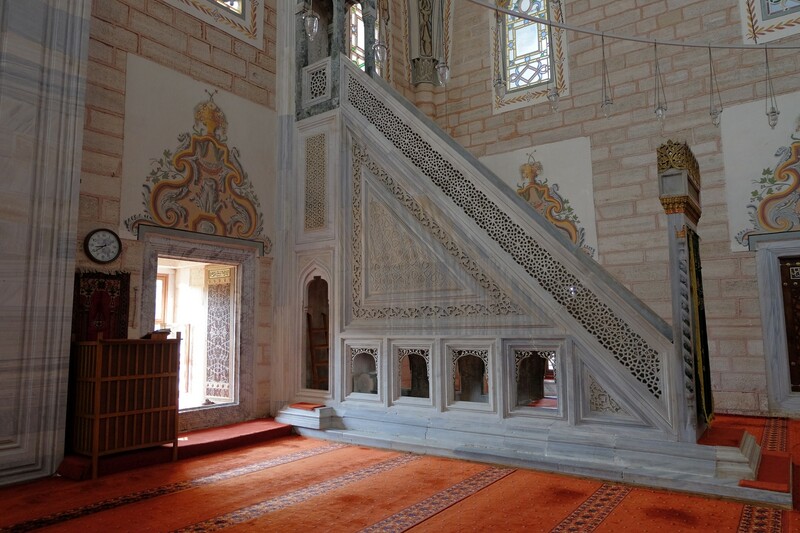 The Sultan's gallery is the first example of such a structure in the Ottoman mosque architecture. 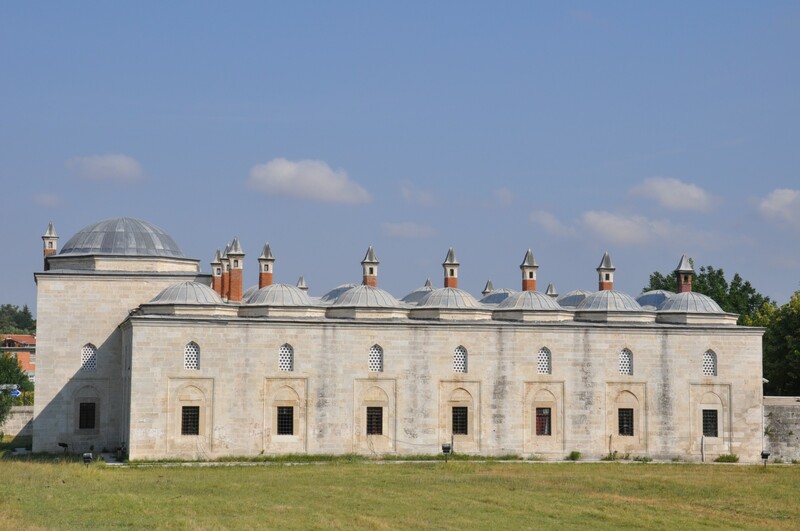 Sultan Bayezid II Mosque Complex consisted of numerous units. 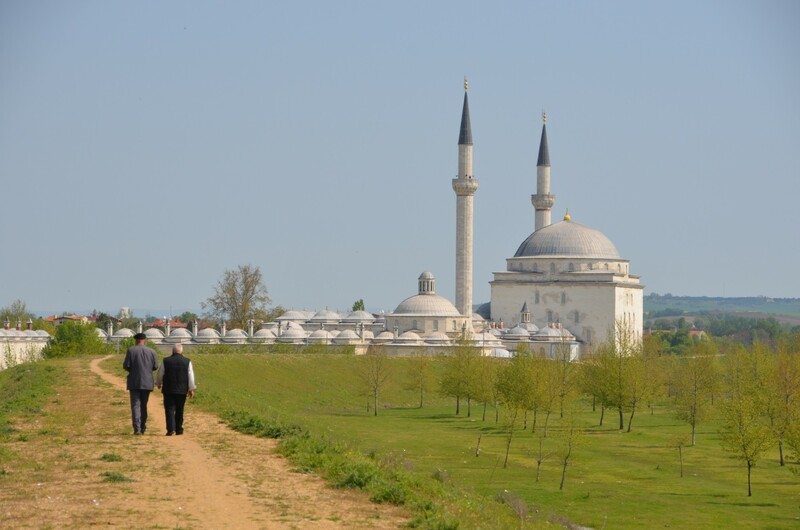 Six of them - the mosque, a hospital, a medical school, two guesthouses and a bridge - have been preserved to our times. The other structures, now destroyed, included a Turkish bath, a watermill, a musical school, an elementary school and so-called muvakkithane that informed people about the date and the time. There were also two guesthouses and a soup kitchen. 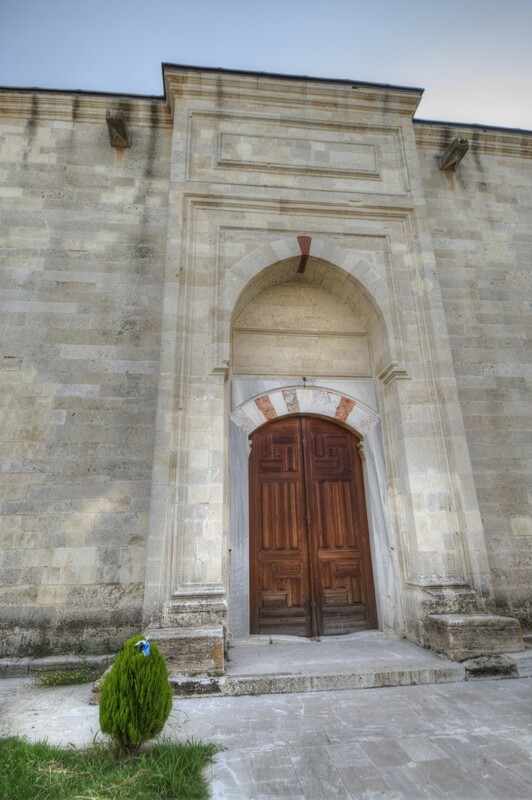 The hospital and the medical school are more widely discussed in a separate text, as is the Bayezid Bridge. 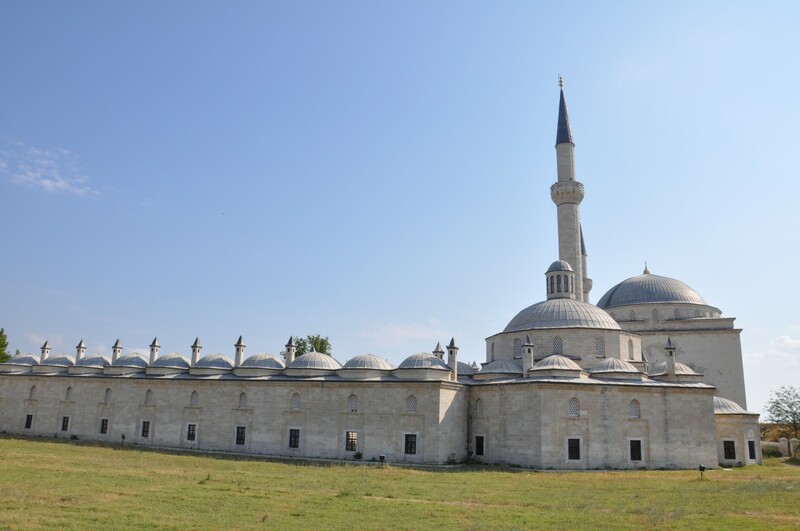 The soup kitchen was called 'Yeni Imaret' (New Soup Kitchen) as it was the last one of eight imarets in Edirne. Soup kitchen buildings included a kitchen, a bakery, a candle workshop, a cellar, a warehouse, and a stable. Meals were prepared there twice a day, to be given the poor of the city for free, and to feed the personnel of the complex. According to a document from 1493, there were 22 people working in the kitchen, including not only chefs and bakers but also an incense dealer and two people to pick rice for pilav. The water mill was a structure that generated income for the complex. 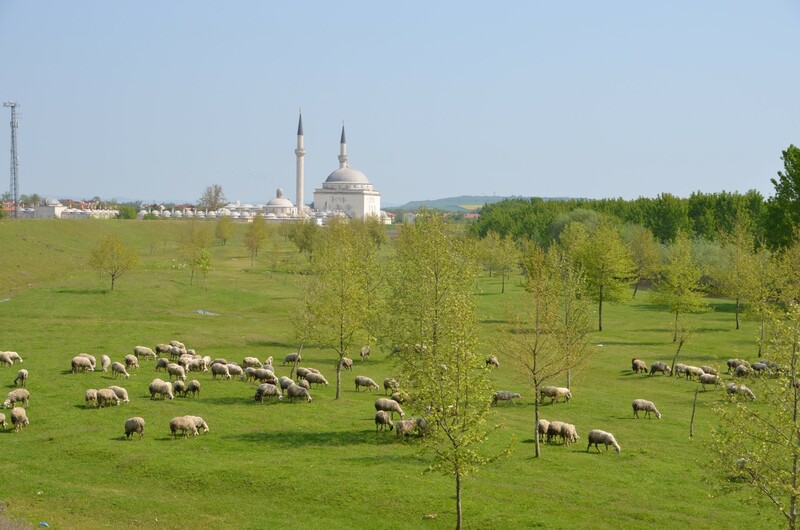 It was situated on the bank of the Tunca River. It was destroyed but had been documented in the old photographs. 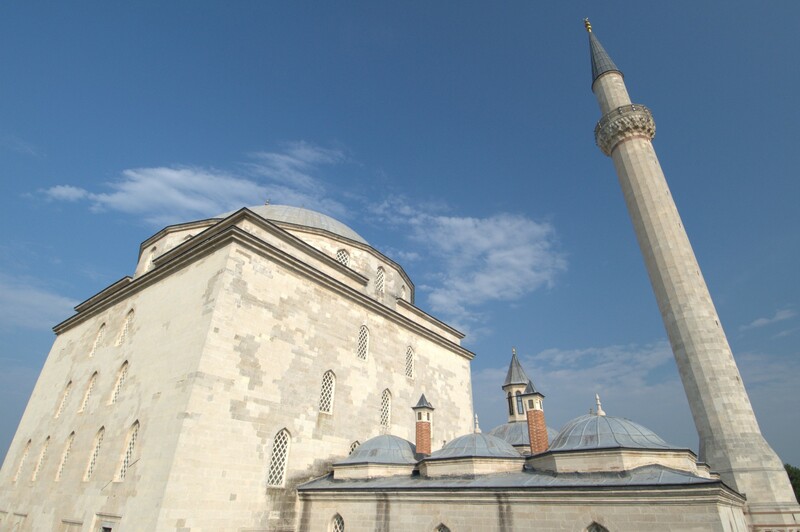 Two guesthouses (tabhane) are situated to the right and the left side of the mosque. 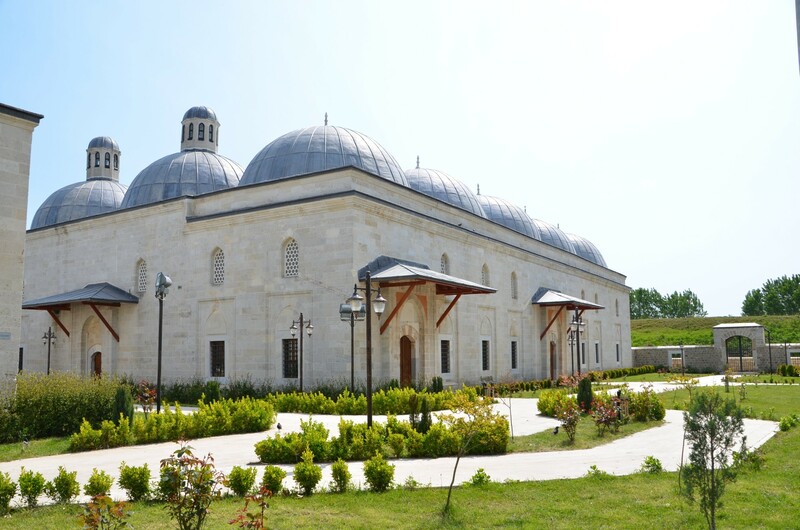 Each building is covered with nine domes. There are four rooms in each guesthouse. The guests and travellers could stay there free of charge. The patients who were discharged from the hospital spent the convalescence period in a guesthouse. 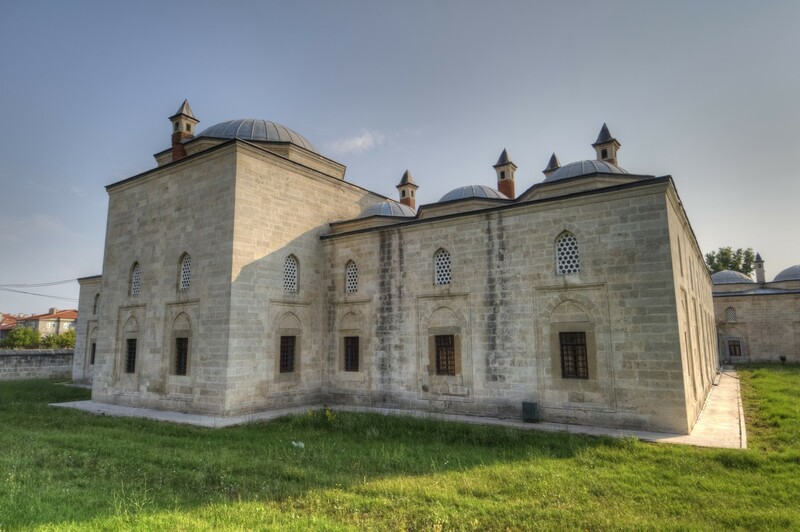 The Turkish bath (hamam) was destroyed so completely that even its foundations have not been preserved. It was situated near the bridge. The building was a double bath shape, and the income obtained from it was given to the charity. The entry to the mosque is free of charge. 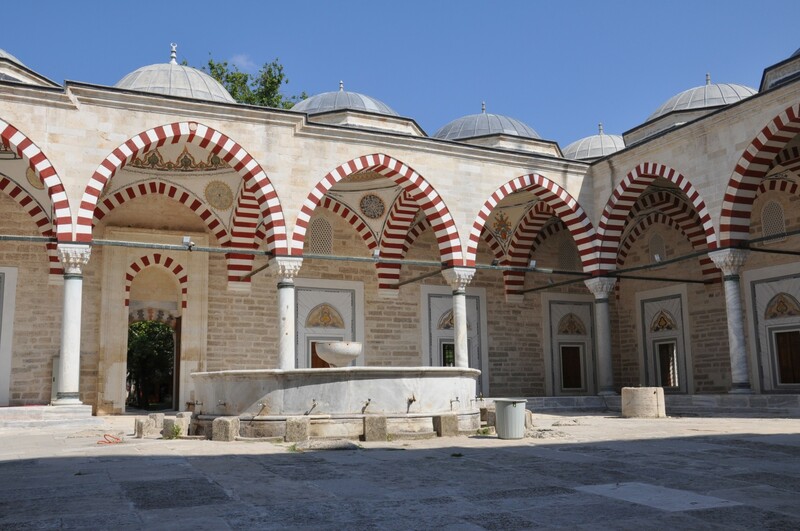 It is necessary to buy a ticket to visit the Health Museum next door, housed in the medrese and hospital of the mosque complex. 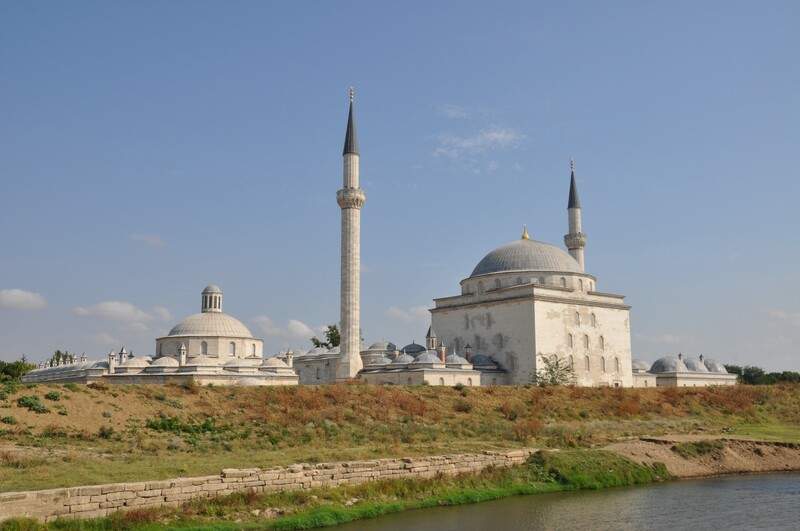 Sultan Bayezid II Mosque Complex is picturesquely situated near the banks of the Tunca River, to the north-west of the historical centre of Edirne. 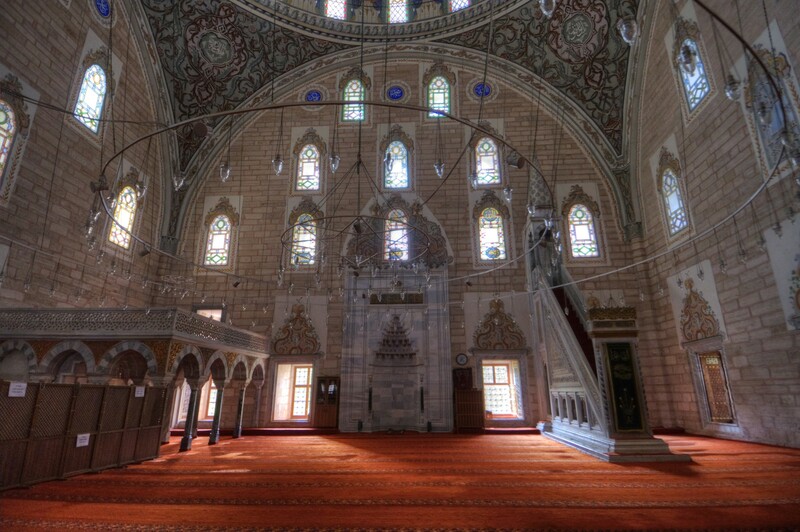 The distance from the heart of the city - the Selimiye Mosque - is 1.5 km. There are two historical bridges over two forks of the river - Yalnızgöz Köprüsü and Beyazıd II Köprüsü.